Sarah: “Tell me more your current replenishment program - how many skus does it include? Sales penetration of your current program? Any how often are you updating it? But in all seriousness, not developing a customized replenishment program for your business - whether it’s brick or mortar, online, or a combination of both - is an absolute miss for your business. You are leaving sales and margin on the table. This week’s post is going deep on replenishment – What is it? Why you need it? And how to get it launched to start rolling in the dollars. WHAT IS A REPLENISHMENT PROGRAM? So let’s get clear on exactly what I’m referencing when I mention a replenishment style. A replenishment style is usually a best selling style that has ongoing reorderable potential. Typically it is a basic style that may ground other fashion styles in your total assortment. It is an item that majority of people would always carry in their wardrobe and is considered an essential. It is often a classic style but can vary from brand to brand depending on the overall assortment and customer need. Examples of traditional replenishment styles would be a basic white tee, a pair of silver hoop earrings, a pair of black men’s dress socks, and an apple scented household candle. All of these items could be found in almost any wardrobe and would be styles that customers would be quick to replace or update frequently. Depending on your brand a replenishment style may be more fashion oriented, like leopard printed ballet flats, but are constantly selling out and don’t have a seasonality to them. The Fashion Pyramid - Your Replenishment program falls under Basics Products. Depending on your business and the categories represented in your store, a replenishment program may penetrate your overall assortment at very different rates. For example, in a fashion heavy boutique, apparel may only offer 15-20% replenishment penetration versus a well-rounded jewelry assortment may have a significant replenishment penetration of anywhere between 30%-50% of your total jewelry assortment. The point is that replenishment offers foundational business for your fashion buys – grounding them so you don’t have just a bunch of fashion pieces without the basics to make the entire assortment look stronger and more cohesive. 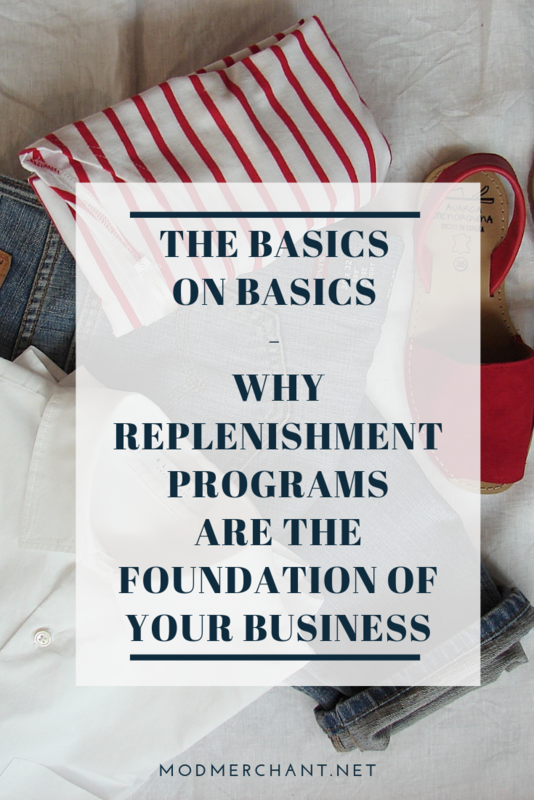 WHY DO YOU NEED A REPLENISHMENT PROGRAM? The benefits of a well-managed replenishment program are significant and can mean the difference between a successful business and a struggling business. So just to be clear…replenishment is that important to your business and can truly be a deal breaker. Sustainable sales – reordering your best sellers basically guarantees that you are developing a portion of your business to become consistent. Being able to anticipate your sales, even partially, removes significant risk to your business and will help your business weather today’s tough retail environment. Replenishment styles aren’t traditionally super trendy and they aren’t going to be the styles that draw in your customer but they will be items that your customer will buy when they see them in your store. They are usually last minute pick me ups, or additional add ons because they are necessary items that are in everyone’s closet. Due to their necessary nature, they will increase your customer’s basket size. As your customer shops for new fashion styles they will also add to their basics wardrobe as they see the items conveniently placed throughout your store. Lastly your basics offer your customers an improved customer experience because of convenience. While they are shopping for new fashion styles, you are offering them styles that you know they want and will buy because your store, whether online or in person, is a one stop shop for what they need. You are offering your customer convenience meaning an improved customer experience. HOW TO GET STARTED WITH YOUR REPLENISHMENT PROGRAM? So you’ve gotten this far and are thinking, “Yeah - I want one of those! Replenishment sounds awesome!” Well it is and getting started isn’t as difficult as you may think. So how do you do it? Well below is a step by step to get your most basic replenishment program rolling. Yes there are variations that you can try in the future, mainly seasonal replenishment, but let’s start with the basics first and you can layer more on at a later date. Review your sales and identify your best sellers. Then drill down those styles to the most basic styles that seem likely to have an ongoing home on your floor or site and in the hearts of your customers. Ensure you are creating a cohesive merchandising presentation that include these styles by looking at your fashion buys and double checking that your potential replenishment styles will have a purpose and home for not just today but in the future. Consider if you should try expanding the style slightly as well. If you have a best selling white tank, it’s very likely that the black version is going to be a winner too so make sure you are considering if you are optimizing each style as fully as possible. Get on the phone with your vendors and ask for additional recommendations based on your best sellers and what their other accounts are having success with. Now is also the time to have the conversation about asking for a cost discount on bulk orders. They will be just as thrilled as you are for ongoing business, making them more likely to accept a lower cost. Plan out your orders and write accordingly. It is better to have more often orders, than to write fewer but larger orders. You want to minimize your backstock so work with your vendors to determine the optimal frequency of your orders. At first, shoot for monthly flows if you can but don’t be afraid to write orders for the next 3-6 months to ensure that you are getting the best deal possible from your vendor. Don’t go crazy. Once you have a few best sellers that seem replenishment worthy it can be really tempting to push the units and assume that you’ll keep selling through on your best sellers. The key though to a strong replenishment program is starting small and building it up based no the need. I’d be conservative in your first few buys to make sure that you aren’t overbuying and ensure that they best selling trend will continue. Remember – it’s always better to be in a position to chase goods than to have an overstock situation. Lastly don’t be afraid to test new items regular that may have replenishment potential. This is more critical than testing fashion styles because the long term value of a best selling replenishment styles is significant to your bottom line. I’d recommend testing a new basics order, full of potential best sellers, at least quarterly. A strong replenishment program not only will drive sales and margin but is a benchmark of a healthy and well developed retail business. While it make take a bit of time to find the correct penetration of your program, once discovered and maintained it reduces the overall risk of your business and in today’s marketplace, reducing risk can mean the difference between surviving and thriving. Have more questions about getting started with your replenishment program? I’d love to hear about it. Tell me in the comments below what your biggest challenges and where you could use a little extra guidance.